This fall has been a whirlwind, but this past weekend we slowed down. . . Inadvertently. 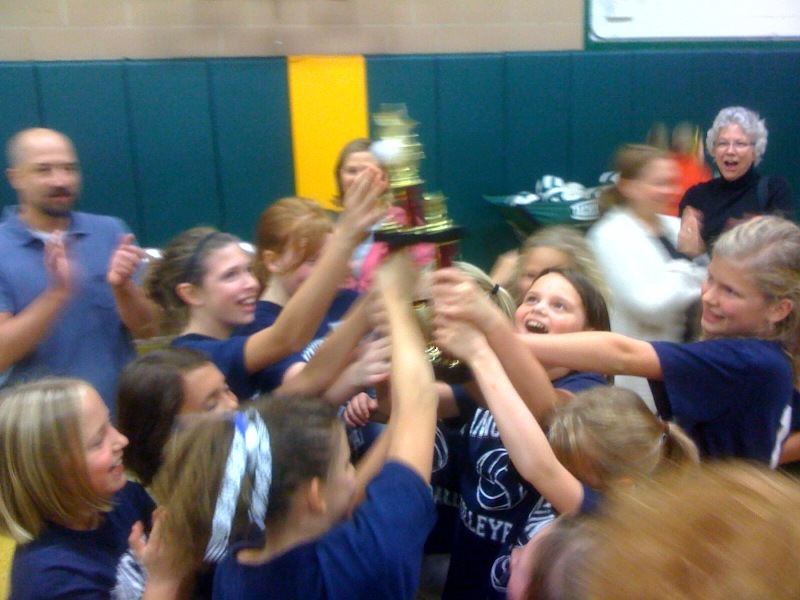 Ten is on her school's fifth grade volleyball team. There are so many girls in her grade that are interested in the sport that they had to create two teams. Anyway, her team has always been the Bad News Bears of the two. When they won, we readjusted, and at an impromptu, unplanned lunch near the tournament (we had one half unexpected hour until the second game) we discouraged Ten from even considering winning the second match and heading to the finals! And then they won the second match and were heading to the finals! BioMom was so excited --she had never participated in any sports tournament in her life (either as participant or spectator) and, with one of her own in it, she realized how incredible it was. We were on the edge of our seat as the last match started. Could they possibly win??? It turned out to be the easiest of the three -- they won in two games! So that was our day: three exciting volleyball games culminating in a trophy! Pictures of Halloween to come. The kids had a blast, and then posted 102 degree fevers for the next three days! Even for the Non-Economists. . .